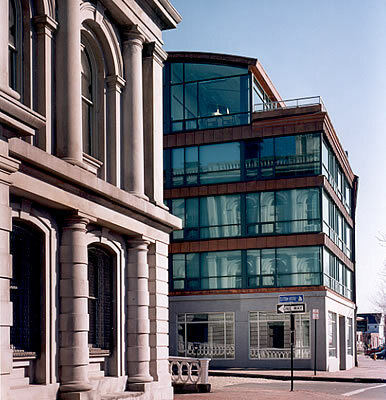 The Blake Block is a commercial office building addition and renovation in Portland, situated next to the historic Custom House Building. The glass and copper structure was designed to highlight and compliment the adjacent historic structures while providing open office space for contemporary business occupancy. The project was constructed in two phases and now extends from Commercial Street to Fore Street and fills the full depth of the block. It has a particularly commanding presence at night as an Eastern visual anchor for the Fore Street corridor.